The Atlantean Sword measures 38 7/8-inches long! This screen-accurate prop replica is hand-forged from high-carbon steel. Inspired by the Conan the Barbarian film. 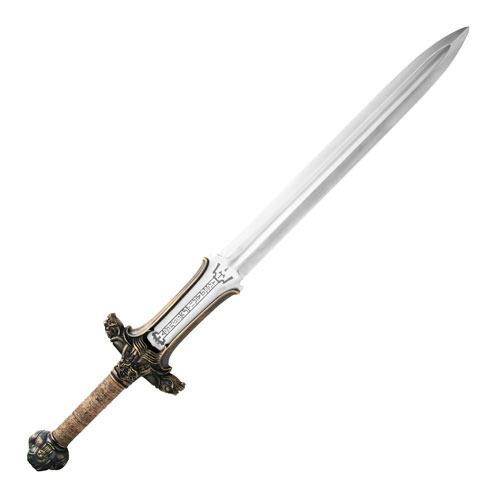 The Conan the Barbarian The Atlantean Sword is a must for fans of Conan the Barbarian. Hand-forged from high-carbon steel and tempered for strength, this sword has been expertly rendered by the master craftsmen at Windlass Steelcrafts as an exact replica of the weapon used on screen. From the intricate details on the guard and pommel to the deep runes on the powerful blade, this is truly a masterful reproduction! The Conan the Barbarian The Atlantean Sword measures 38 7/8-inches long and boasts a 28 1/8-inch blade. Certificate of authenticity included.